Line SS - Franklin Avenue Shuttle (line sign SS was used by all shuttle lines) in New York's subway (former BMT). The simulation is as the line was in the year of 1969. This partially single track shuttle line from Franklin Avenue to Prospect Park in Brooklyn had at that time 5 stations. 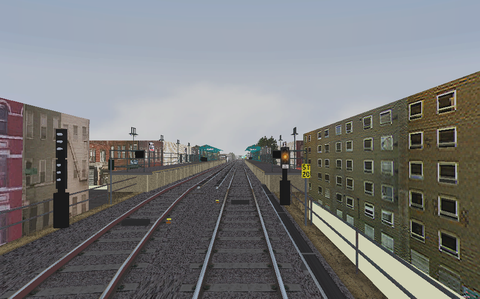 This route is of very high class with a lot of urban landscape details, soft curves and realistic signals and switches. Alternatives for this route are all southbound and based on time of day and/or weather. Everything on the Franklin Avenue Shuttle.